Photography is all about lighting, and a softbox for Speedlight will help you take better photographs. A softbox is, as the name implies, a box made of a soft material that can be folded down for easy transport. It is used to diffuse light from an artificial source, and make the spread wider and more even (Source). Speedlight is a term used to describe a particular kind of flash photography. Speedlight itself is a Nikon brand name, but other companies have named their variations Speedlite – the implication being that the flash produced is shorter than standard flash photography, but also much brighter. This makes for better-illuminated photographs, but it can make for strong shadows and harsh lighting, not bringing out the best in the subject. A softbox will help ensure that the flash smoothly covers the scene in the photograph, and reduces the chances of having one particularly harsh spot in the center. In this guide, we will look at five top-rated softboxes for Speedlight. 7.1 Can it be moved easily? 7.4 How Big Should a Softbox Be? 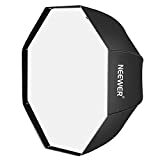 Neewer 32 inches /80 centimeters Octagon Softbox Octagonal Speedlite, Studio Flash, Speedlight Umbrella Softbox with Carrying Bag for Portrait or Product Photography. 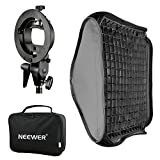 The Neewer Octagon Softbow is an umbrella-style softbox that is designed to be mounted on a studio stand. This product is 32 inches; hence, it is suitable for a number of purposes, including portrait and product photography. However, it may be a little too small for full body photography. This softbox is constructed from a light metal frame (aluminum) with a nylon cover. Thus, it is partially weatherproof. Additionally, it is foldable in standard umbrella fashion and becomes quite small. Moreover, the exterior is black, while the interior is reflective silver. It also boasts of a detachable diffusing front cover that you can use as a reflecting umbrella. A zippered section is included to allow for insertion of stands or studio flashes, too. Finally, it is light enough to be portable, can be quickly set up and taken down, and comes with a carrying bag. This softbox features a Bowens mount for compatibility with other equipment and stands. While not a complete traditional Bowens mount, it does attach firmly with a plastic grip. This 24-inch square product is colored black on the outside, with a silver reflective surface on the inside. Additionally, it pops up quickly and includes two different removable diffusers. The first layer, placed in from of the reflective interior, is a standard partially-opaque filter. Meanwhile, the second layer goes closer to the subject and is a grid-style cover. Both can be used individually; thus allowing you to fully tailor the way the light falls in your shot. Moreover, without the diffusers, the softbox can be used as a reflector. However, despite being large enough for portrait photography, it may not provide enough light for full body shots. Larger sizes that would be suitable for full body shots can be bought from the manufacturer, though. Lastly, this particular softbox for speedlight comes with a carrying bag to aid portability and to protect accessories. It can also be folded down quickly. 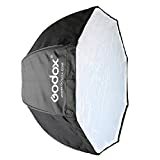 The Godox Octagon Softbox is quite large at a 47.2 inches in diameter. It is black on the outside and reflective silver on the inside. As with other softboxes, the diffusing layer is removable and allows for reflector use. The diffusing layer attaches with Velcro. 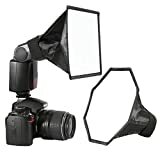 Additionally, its general set up is fast, as the softbox folds like an umbrella and has zip access for attaching to a studio stand. Once mounted, a degree of tilt can be achieved, too. Finally, it can be used with flashes and some studio flash lights with umbrella holes. It also comes with a cleaning cloth and a carrying bag. The Waka Flash Diffuser Light Softbox takes a very different approach. The package contains two softboxes: one rectangle, one octagon. The softboxes themselves fit over the flash that is mounted on the top of the camera. This makes it truly portable, but not necessarily great for larger subjects. The boxes are secured in place by an integrated Velcro strap that tightens around the flash head. Different sized flash heads are compatible, as the base of the softbox has a stretchable opening. Both softboxes are made from black nylon, while the inside is reflective silver PVC. Meanwhile, this box is collapsible and includes a bag for transportation. It rectangle measures 8.46 inches by 6.69 inches, while the octagon has a diameter of 8.67 inches. Overall, they produce very even lighting, compared to even larger softboxes. The MChoice softbox is a ring diffuser, which means it is shaped like a donut. Also camera mounted like the Waka, the flash mount sits inside the ring while the lens of the camera pokes through the hole in the center of the softbox. With a diameter of 17.71 inches, it is more than twice the size of the Waka product. Hence, it is suitable for portrait and product photography as well as macro photography with even light and no shadows. Additionally, this softbox folds down even smaller and pops up again in seconds with a very simple folding mechanism. Therefore, this can easily be used in a studio or on location. Any softbox will do the job, but quality often matters. Some softboxes spread the light further than others. Aside from that, there are several factors to consider when choosing the best softbox for Speedlight photography. Can it be moved easily? Unless you are taking photos only in your own studio, you will need a softbox that is quick and easy to move around. This means that it should be lightweight, compact, and portable. It also needs to be easy to set up – there’s no point in being able to pack it down to the smallest possible size if it will take a long time to restore it to its original size. A softbox diffuses light – this means it makes the light cover a wider area. How wide that area is and how far away the light falls are things that the photographer should be able to decide. A good softbox will have simple makeable adjustments to alter the diffusion in angle, size, or distance. If the softbox is constantly being put up and down, transported, and adjusted, it should be made of strong materials that will last. Strong synthetic materials are good, such as nylon and plastic. These will also provide a degree of waterproofing, which may be important during transit. Another important feature is what the light diffusing area is made of – is it a good diffuser of light? Most diffusers are made of a semi-transparent fabric to allow the light to pass through, often with a reflector behind them. Make sure the specifications of the softbox match the types of photographs you intend to take. How Big Should a Softbox Be? As a general rule, a softbox should be a similar size the main subject of the photograph. For example, if you are taking a headshot, the softbox would normally be 2 feet or less in size. On the other hand, if you are taking a full body shot, the softbox would need to be at least 4 feet in size, preferably larger. This is not a hard and fast rule, as different effects can be achieved by using alternative sizes. The thing to remember is, the larger the softbox, the more the light is spread, and the softer the light appears. Smaller softboxes that attach directly to the camera often spread light as well as larger boxes that attach to separate flashes. 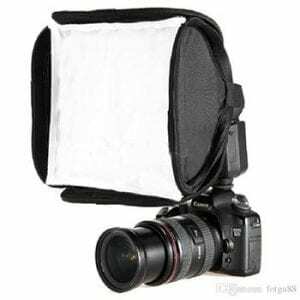 Also, softboxes that are directly attached to the camera work very well for product and macro photography, and can produce good results without having to place products in a separate lightbox. It’s also important to consider how close to the subject the softbox will be, as this will again have a bearing on the size of the box required. Not all softboxes are diffusers – some are simply reflectors or other similar accessories. A diffuser spreads the light evenly and minimizes shadow interference, while a reflector will produce a much harsher light with stronger shadows. If your photography style demands it, choose a reflector. However, a diffusing softbox is normally a much better choice for Speedlight flash photography. 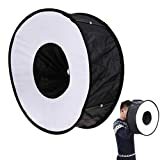 On the other hand, some softboxes are convertible from diffuser to reflector, relieving you of making a choice and giving you the flexibility to take your photos with lighting just the way you want it. Most softboxes will have a universal mount attached to them, or the option to have one added. This means they can be placed on top of standard studio tripods or pole stands. Hence, it makes vertical adjustment easy. However, other adjustments, such as tilting to angles, may not be so easy. Some softboxes may be tabletop based or even handheld and mounted directly on the camera – check how the softbox needs to be mounted before investing in one, as one kind cannot always be easily converted to the other. 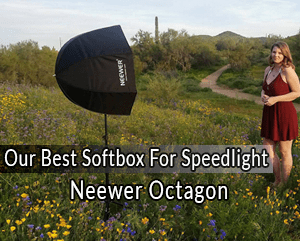 The Neewer Octagon softbox does everything it needs to – diffuses light, accepts studio flashes, fits on a standard stand, is convertible into a reflector, and is light portable. The only downside is its lack of ability to tilt, but it ticks every other box. Depending on your needs, you may opt for that or choose from our list. Remember, the ultimate in portability are the two smaller softboxes that attach directly to a handheld camera. Having one of these on any photo shoot will help tremendously, but they may be unsuitable for your particular style of photography. 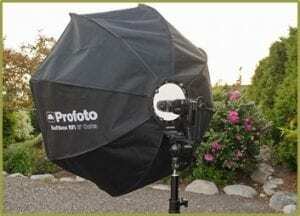 What will you use a softbox for Speedlight to take pictures of? Comment below! Greg works full-time as a software developer, but enjoys writing about Tech products and gadgets in his free time. 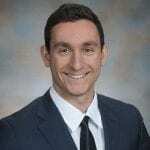 He previously worked at Verizon as a Security Analyst, and most recently at Bloomberg as a Data Analyst. 10BestRanked.com is a participant in the Amazon Services LLC Associates Program, and we get a commission on purchases made through our links. 10BestRanked.com reviews the top ten products in various categories to help you make an informed buying decision. COPYRIGHT © 2018-2019 · 10BESTRANKED.COM, ALL RIGHTS RESERVED.